On initial consideration, the project of reconciling the eponymous thinkers of this volume may appear to be a futile exercise . Heidegger as the unofficial philosopher of the Third Reich and Marx as the pre-eminent theorist of proletarian revolution might seem to be as far apart on the ideological spectrum as two figures could possibly be. As the author himself states in his Introduction: ‘To attempt to address the thought of either on his own betrays a deal of ambition: to have attempted both, and together, is perhaps to have doomed oneself to failure’ (3). The sub-title of Hemming’s comparative study, however, is an indication that he rejects such a peremptory judgement. Hemming sets out to establish that these two giants of the philosophical pantheon actually share a common conceptual heritage and, furthermore, that their rival systems can jointly form the pillars of an innovative and radical critique of our epoch. The author’s ambition for the fruit of such a theoretical assimilation is certainly not undersold: ‘we should hear here the concern for the destiny and whereto of, not only Europe, but also the planetary reach of European thinking and so, therefore of the whole globe’ (27). Unsurprisingly, Hemming’s conceptual construction does not ultimately sustain this vaulting ambition but he merits significant credit for challenging the reader to re-examine suppositions concerning Heidegger and Marx and their respective contributions to modern philosophy. One of the most valuable aspects of the book is the highlighting of Heidegger’s irregular but significant observations on Marx throughout his career which many readers may find surprising. The key text considered by the author is a work by Heidegger from 1946 known as the ‘Letter on Humanism’, which includes a critique of Sartre for misconstruing a productive dialogue between phenomenology and Marxism. Heidegger’s premise in this work is that such a convergence is not impossible but that Sartre has not devised it appropriately. Hemming also refers to a television interview in 1969 in which Heidegger displayed not only familiarity with Marx’s ‘Theses on Feuerbach’ but also evidence that he had analysed them at length and with considerable sympathy (18-9). 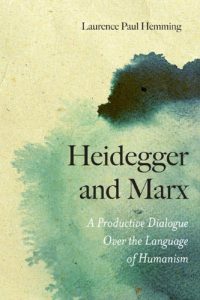 Hemming also points out that if these interactions appear sparse on Heidegger’s part, it is likely due to the restrictions on reading Marx he would have encountered in Hitler’s Germany, and also that in the post-war era Heidegger would not have wanted to appear to award philosophical legitimacy to the Stalinist regime in East Germany. Having highlighted these reflections on Marx by Heidegger, Hemming also usefully provides a reminder that he is not the first writer to engage with the two thinkers in a comparative manner. The author’s best-known precursor was Herbert Marcuse and his attempt to construct ‘Heideggerian Marxism’ in the 1930s (29). As a PhD student under Heidegger and a radical thinker who would ultimately find a political home within the Marxism of the Frankfurt School, Marcuse might appear to have been well-placed to devise a rapprochement between the two seemingly disparate systems. However, Hemming argues that Marcuse fundamentally misunderstood the nature of Heidegger’s deconstruction of metaphysics, in the same manner that Sartre would do a few years later. The notion of ‘Dasein’ as crucially formulated by Heidegger in Being and Time was not simply a revised notion of individual subjectivity but a complete reconfiguration of the subject-object premise of Western thought since Descartes. Marcuse, according to Hemming, never fully grasped the implications of this paradigm shift: ‘The problem with this interpretation – even apart from its conflations – is that it inevitably drives the interpretation of Dasein toward becoming a masked name for the subjectivity of the subject’ (30). Likewise, Hemming contends that another iconic figure in Marxist philosophy engaged with Heidegger on the basis of a flawed appreciation of the nature of Dasein: ‘Lukács…fails to address sufficiently the critique of subjectivity in the text, interpreting Dasein as the figure of the isolated individual and so a masked name for the subjectivity of the subject ’ (34). Hemming similarly dismisses the view that Being and Time was influenced by Lukács’ earlier History and Class Consciousness, despite the discussion of reification in the former. The author consequently seeks to reformulate a putative Heidegger-Marx dialogue on a new foundation, without committing what he regards as the conceptual misunderstandings of Sartre, Marcuse and Lukács. Hemming contends that the starting point for a renewed ‘productive dialogue’ between the two figures should be a recognition of their shared concern for the special status of Germany, both as a site of philosophical innovation and as a decisive arena for political hegemony. Marx’s famous observation that ‘the Germans have, in their politics, thought what the other peoples have achieved’ (125) is reminiscent, according to Hemming, of Heidegger’s belief in ‘the special inner relationship of the German language with the language of the Greeks and their thinking’ (128). The author also correctly notes that later followers of Marx, above all Lenin, were acutely aware of the strategic significance of Germany as integral to the prospect of global socialist revolution (137). The notoriously awkward aspect of this comparison is, of course, that Heidegger’s elevation of German culture contributed to his seduction by the rhetoric of Nazism and his brief but significant role as philosophical standard-bearer for Hitler in 1933-4. Hemming is keen to point out that this period in Heidegger‘s career – known as the ‘rectorate’ – was later acknowledged by the philosopher himself as ‘the greatest stupidity of his life’ (152). However, the author’s attempt to exculpate Heidegger’s collaboration with the Nazis as part of a philosophical misunderstanding on his part has the effect of underplaying the venal role Heidegger played in providing intellectual legitimacy when the regime had not fully consolidated its grip on power. Hemming justifies the rectorate on the grounds that ‘Heidegger consistently distinguished between the Nazi Party and the movement that had brought it to power in a way that has too rarely been acknowledged’ (155). However, the precise nature of this so-called ‘movement’ and it how it was supposedly independent of the Nazis is not elucidated. The comparison with Marx on this issue is also ultimately unpersuasive because for Marx and Lenin the centrality of Germany was related to the advanced nature of its industrial development and the demographic weight of its working class, and had nothing to do with the literary peculiarities of the Germanic language as argued by Heidegger. Hemming also contends that the two figures are intellectually conjoined by their joint debt to Hegel and the tradition of German idealism which climaxed with his thought. The eleventh Thesis on Feuerbach mentioned by Heidegger in his 1969 television interview is conventionally interpreted as the young Marx turning his back on Hegel and calling on revolutionaries to push philosophy aside in the name of practical activity: ‘Philosophers have only interpreted the world differently; the point is to transform it’ (quoted 18). Heidegger’s reading of this line in the interview is radically different and in fact points towards the opposite conclusion. He argued ‘it is overlooked that changing the world presupposes a change in the positing of the world … It gives the impression that it speaks against philosophy; whereas the second half of the statement presupposes a demand for philosophy’ (quoted 17-8). Hemming goes on to argue that Heidegger’s revolutionary shift away from the subject-object bifurcation of traditional epistemology and on to the question of Being provides a suitable platform for such a re-positing of the world. Unquestionably, Hemming is right to observe Heidegger’s ontology overthrows the traditional conception of humans and their place in the world that has dominated Western thinking since the early modern period. The central concept of ‘Dasein‘ in Being and Time is usually interpreted as ‘Being-in-the-world’, a perspective that overcomes the subject-object dichotomy and places humans in a unitary relationship with the world that cannot be split asunder. As Hemming puts it, ‘Existence is bound to the world, and cannot be unbound, as Descartes had tried to effect through his exercise of the method of doubt’ (176). He defends this revolutionary approach as Heidegger’s most valuable insight into the human condition, and also affirms the philosopher’s critique of the attempted appropriation of Dasein by Marcuse and others: ‘The word Dasein never functions in any of Heidegger’s texts … as a masked name for the philosophical subject’ (170). Hemming argues the concept is more accurately translated as ‘here-to-be’ or ‘here-being’ (171). This apparently marginal nuancing of the concept, however, completely alters its significance according to the author: ‘Marx’s metaphysical understanding of the primacy of human being as species being ‘(170) is rejected and in its place is installed a ‘more primordial understanding of the placidness of being, of the da of Da-sein’ (171). Hemming underlines Heidegger’s view that the Pre-Socratics were closer to this appreciation of Being than later generations of Western thinkers (205). Hemming continues that, unlike the Pre-Socratics, Marx inculcated the traditional subject-object framework that led him to insert the species-being of humans as the locus of philosophy. This, in turn, led to ‘Marx’s claim that the whole of nature is in a very direct way here for man’ (202). Heidegger’s ironic comment that Marcuse had misunderstood ‘Dasein as always mine’ (quoted 205) could also be read as a critique of the anthropocentrism he regarded as intrinsic to Marx’s view of the world and our place in it. The alternative, according to Hemming, is to insert language itself at the nodal point of analysis of Dasein. Heidegger’s two iconic comments that ‘Language speaks, not man’ (143) and ‘language is the house of being’ (213) are both premised on the decentring of the subject from metaphysics and the relocating of conceptual focus onto process and structure. This aspect of the ‘Later Heidegger’ is one of the pivotal developments in the rise of French post-structuralism, to which the thinker owes a lot of his current stature. Hemming explicitly rejects Marx’s alternative understanding of language as intrinsically linked to human social development. The author summarises this view as explained in The German Ideology: ‘The suggestion is that consciousness here precedes the development of language. As society develops, language develops with it as an effect of that higher development. Language is a consequence of the organisation and development of production’ (209). At this point, ‘the productive dialogue’ Hemming wants to facilitate between Heidegger and Marx starts to break down. Curiously, there is no mention of Althusser in the book, but his shadow falls over the framework Hemming is seeking to construct. Any attempt to construct a hybrid of Marxism with a decentred version of Heidegger’s subject-less universe will inevitably invite comparisons with Althusser. The well-documented antinomies of that system suggest Hemming’s project is as doomed as he anticipates in his Introduction. A materialist conception of language is irreconcilable with Heidegger’s ahistorical notion that ‘language is the essencing of man’ (213). Like Althusser, Hemming aspires to subvert the ‘humanism’ of Marx that foregrounds humanity’s place in nature. In contrast, key Marxist philosophers of language, principally Engels and Voloshinov, have coherently defended Marx’s diachronic version of linguistic analysis. A theological dimension introduced towards the end of the book also undermines its viability as a possible source of rebooted Heideggerian Marxism. Heidegger’s discussion of the coming of an enigmatic ‘Last God’ as the solution to metaphysical quandaries is interpreted by Hemming in a quasi -mystical manner that is wholly incompatible with historical materialism: ‘Who is the god for whom Heidegger says we must be waiting … A nation, a people, a place receives its fate and dwells with it – a fate and destiny not of its own making and toward which it may rise up with force and enthusiasm or only reluctantly’ (280). This tone of religiosity in the conclusion leaves the reader with the impression that Hemming is an erudite and stimulating guide to the conceptual terrain shared by the two thinkers but that his attempt to unify them is ultimately a heroic failure. In his 2013 book, Heidegger and Marx. A Productive Dialogue over the Language of Humanism, Laurence Paul Hemming proclaims, “The only person to have attempted a full-scale synthesis of Heidegger’s and Marx’s thinking is Kostas Axelos.” This assertion comes as some surprise considering not only my own extensive and intensive engagement with both Marx’s and Heidegger’s thinking over many decades,** but also the work of H.D. Kittsteiner in Germany, whose Mit Marx für Heidegger – Mit Heidegger für Marx was published in 2004 (cf. my critique of Kittsteiner at arte-fact.org). The restriction of Hemming’s book to considering, in the usual arbitrary scholarly fashion, only “the language of humanism” is a violent truncation of Marx’s thinking, since the so-called “humanist Marx” is the young Marx of around 1844, when he wrote the Economic-Philosophical Manuscripts, the only text of Marx’s with which Heidegger himself bothered to engage. Marx’s mature thinking is not considered. Not only that, the rereading and reconstructing of Marx’s uncompleted critique of political economy as the basis for a dialectical theory of the totality of the capitalist form of society, initiated in 1965 by Hans-Georg Backhaus in Frankfurt with his Dialektik der Wertform, first presented in an Adorno seminar, is not even mentioned. Quite an achievement in ignorance, although not uncommon. But it is precisely through a reassessment of the dialectics of the value-form and its consequences for thinking through the mode of sociation in capitalist society via reified value that Marx, by returning to Aristotle’s Nicomachean Ethics, offers his best for a social ontology of the modern world that serves as a corrective to Heidegger’s one-eyed fixation on modern technology as the consummation of Greek _technae poiaetikae_. The terrain on which Heidegger and Marx are to fruitfully engage is not that of humanism, but the question concerning the multifaceted phenomenon of value (Gk._timae_), not only in its reified, capitalist form, but as the evaluating, estimating power interplay infusing all sharing of a social world. Not only tame and inconsequential Heidegger scholarship, but also politically and ideologically committed Marxism remain worlds away from any engagement with thinking through the primordially sociating phenomenon of value, and hence incapable of bringing the phenomenon of social power to its concept. Instead it is taken merely sociologically as an all-too-familiar, ontic given, without ever revealing its ontology as estimating power plays among whos..
** My book, Capital and Technology: Marx and Heidegger, first published in German in 2000 and available also in Chinese, is only one part of my attempt to take both Heidegger’s and Marx’s thinking further, not through narrative scholarship that merely ‘talks about’, but through a demanding conceptual thinking-through of the phenomena themselves. Further reading available at http://www.arte-fact.org: Social Ontology, along with Capital and Technology: Marx and Heidegger, both of which serve to deepen my criticism of Hemming’s book for those few willing and able to grapple with decisive philosophical questions by attempting to interpret the phenomena at issue closely with well-fitting concepts.